I was in the garage (at the million dollar Monterey house) and the garage door opener was mounted the SAME WAY. How's that for scary? Picture #2. Remember. 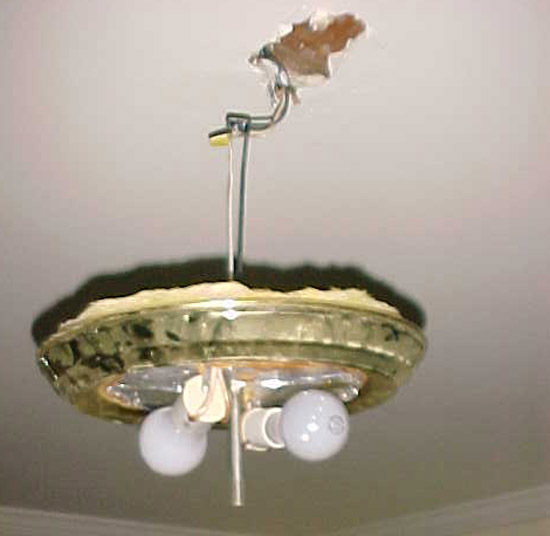 This was the previous owner, not an electrician. If you're looking for a ceiling box, or a pancake box, or even toggle-bolts or a moly, you won't find them. They weren't there. Is this some sort of a flexible, "Earthquake-proof" mounting technique?. Saw a bunch of that style wiring when I re-did my wife's grandma's panel, and changed out some fixtures. First clue was wood or sheet metal screws holding up the fixtures. 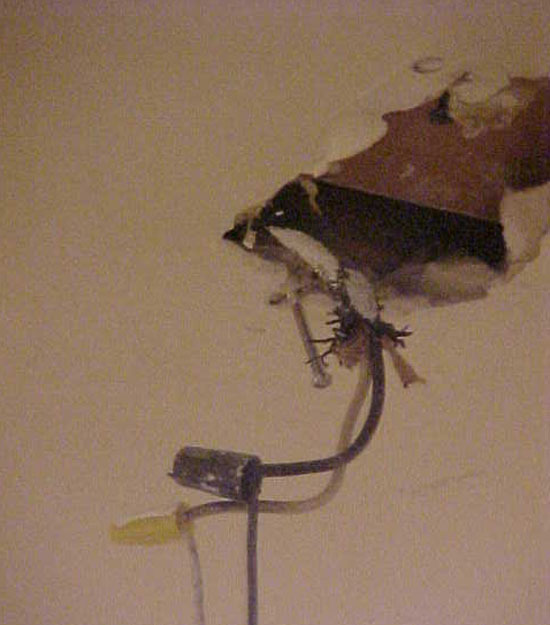 Second clue (brick to the head) was the older (no grounding conductor) NM cable sticking through a hole in the drywall. I guess in those days (scarily enough, the 1950-60's) in unicorporated St. Louis county, fixture boxes were "extras" for the contractor... thank goodness for plastic retro/remodel boxes.